I was a bit undecided whether to place this under antique porcelain reproductions or fakes. Its essential content is overlapping into both areas. The difference between a reproduction of an antique item and a fake antique is mainly its "intent". Definition of a reproduction as opposed to a fake A reproduction is a newer copy of an earlier or ancient type of porcelain or pottery. Made with the intent of re-creating its beauty for the benefit of a later generation, it was made in reverence to the abilities of artisans of the past, so to say. Many fakes of Chinese antique ceramics, on the other hand, are made and sold with the sole intent to deceive. Without this intent they would be just reproductions. Another feature of fake antiques is that they usually are made to look old. This is done purely for monetary gain and therefore is forgery. Today even in Jingdezhen, the porcelain capital of China such fake antique porcelain is produced. 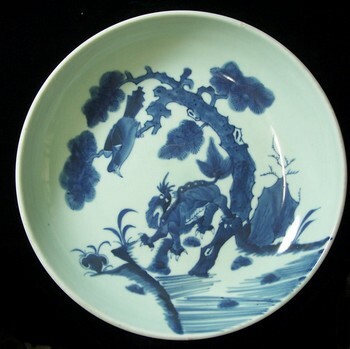 Reproductions were made at the Jingdezhen kilns for hundreds of years, sometimes even by the imperial kiln. It is unfortunate that this sprawling porcelain production center with a relevant history of over a thousand years is now heavily involved in faking too... and this apparently with the knowledge of the China's government. Reproductions of antique ceramics were already made in ancient China. The earliest known reproductions are copies of Jun wares made in the Yuan dynasty. However, that is not considered outright faking as it was made in continuation of the Song dynasty ceramics production. This blue and white charger has a very nice Qing dynasty (Kangxi-Yongzheng) decoration - but its flawless glaze and perfect bottom show no age signs - new! The real imitating or copying began during the Ming and Qing dynasties, when artisans of Jingdezhen began imitating ceramics of earlier periods. Sometimes this was apparently done to such a degree (in the past as well as today) it is very difficult to determine whether an item is, for example, a real Ming piece or a reproduction made during the early Qing dynasty. Later on in the Qing dynasty porcelain items of the early Qing dynasty was also copied. Some of these antique reproductions were ordered by high-ranking court officials. Of course, from our present viewpoint these copies from the Qing dynasty or earlier also have a legitimate status as antiques. These antique porcelain reproductions were never intended to deceive. Unfortunately, the same cannot be said of the following example. The picture below shows an apparently old porcelain panel. Its one of a pair used for wall decoration. 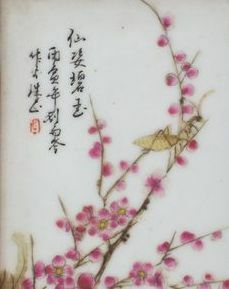 The signed artist is one of the "Eight Friends of Zhushan". Closer inspection reveals, however, that the calligraphic style on the panel is different from the style used by that specific artist. Therefore it cannot be an antique porcelain reproduction but a fake. The panel is old, but the writing style does not correspond to that of the signed artist. Thus the conclusion must be that it is an early 20th century fake. Europe has also copied some Chinese porcelain in the 19th century and earlier. European imitations of Chinese porcelain. Information shows that some of these old, high-quality European replicas were imported into China in recent years -- we just have to wonder if these antique porcelain reproductions from Europe are now going to be passed off as genuine Chinese antiques too...?